VK5 National & Conservation Parks Award. 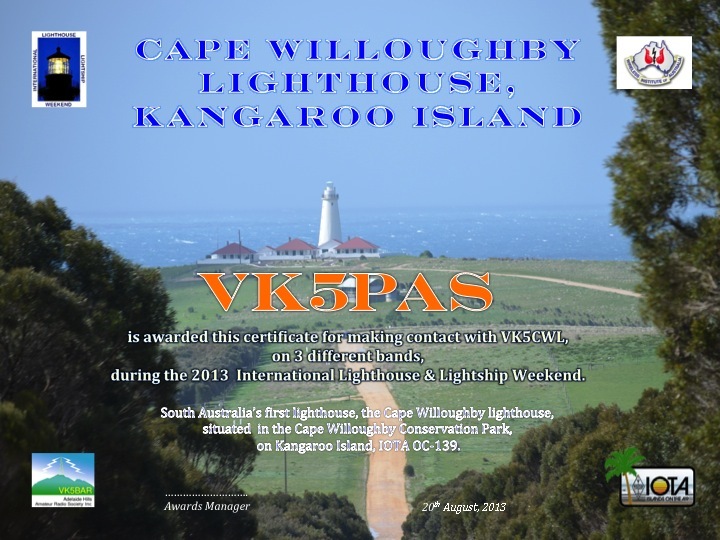 As the Cape Willoughby lighthouse is located within the Cape Willoughby Conservation Park, AHARS are offering a special certificate for contact with VK5CWL during the period Fri 19th - Mon 22nd August, 2016. Contact with VK5CWL MUST be on 3 different bands to qualify for the certificate (can be mixed modes). No need to send an envelope. Certificates are printed out on A4 glossy photo paper and will be mailed back to the recipients.